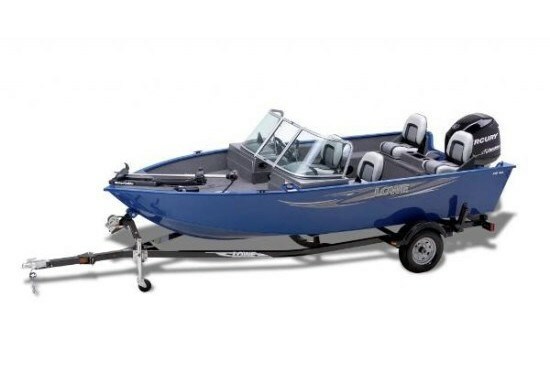 For 2013, Lowe Boats of Lebanon, Missouri, offers an amazing eighty-six models of aluminum fishing boats, hunt, utility, Jon boats, pontoon boats, and one deck boat in nine series ranging from ten to twenty-five feet. The FM Pro 165 WT subject of this review is part of the five model Deep-V Fishing series which includes two SC (Side Console) and three WT (Walk-Thru) models in sixteen, seventeen, and eighteen feet. 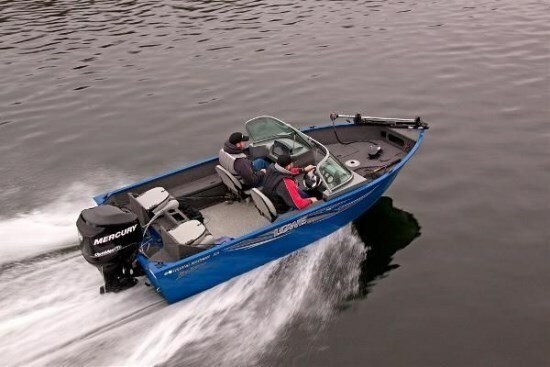 For a sixteen foot boat, the FM Pro 165 WT is a deep boat with a side depth of 38” (.97m), a maximum weight capacity of 1,456 pounds or six persons, and a maximum horsepower rating increased this year to 90, which Lowe claims will let it top out at about 43 mph with three adults aboard. Its all-welded aluminum construction features a full-length extruded keel and Lowe’s reverse-chine V-Tech™ hull design which helps provide a smooth and dry ride. 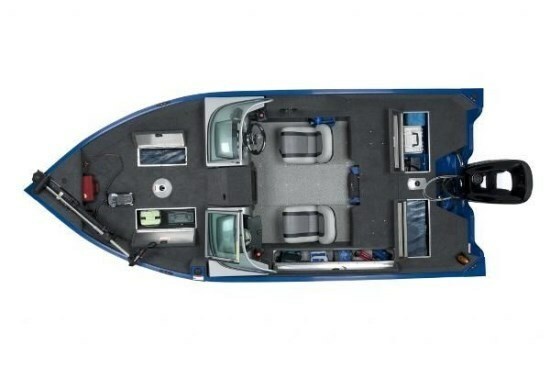 The bow and stern fishing decks are each huge, together accounting for about three-quarters of the interior space, leaving the helm and passenger area of the cockpit only the room it both deserves and needs to perform its function of getting you to and from the fishing holes. These two fishing/casting decks therefore provide you lots of freedom of movement to tackle the fun at hand. The entire deck area is covered with 16 oz. charcoal coloured marine carpet. The forward fishing deck starts between the two consoles and contains a centre locking rod storage locker with tubes which accommodate four 6’6” rods plus two 7’ rods. Additional gear storage plus lockable rod storage is located along the port side and will accommodate up to 7’ rods. On the starboard side of the forward fishing deck is a 20-gallon aerated livewell and opposite this on the port side is an in-deck storage locker. Mounted on the very forward bow deck is the standard FW46 MotorGuide® 46-pound thrust 12-volt trolling motor. There is an additional small storage cubby under this deck also. The aft fishing deck features a second 19-gallon aerated livewell plus another in-deck storage compartment plus an additional centre under-deck storage area. More storage is located along the starboard side gunnel of the FM Pro 165 WT. The dual acrylic helm consoles are topped with a high, centre opening full windshield. The passenger port side console contains a lockable glove box. A driver’s helm seat with slider faces a soft grip steering wheel and “plug & play” instrumentation which includes a tachometer, speedometer, fuel, and trim gauges. 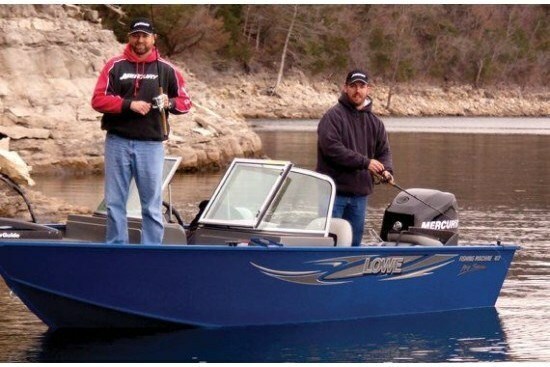 A Lowrance® X-4 Pro compact fish finder is standard equipment as is a 12-volt receptacle. Four pedestal mounting seat bases are provided to accommodate the two standard seats supplied. A painted bunk trailer with swing tongue is standard with your FM Pro 165 WT and you have five colour options from which to choose – metallic silver or black along with red, white, or blue. Some notable factory options include your choice of Mercury® outboard power from 50 to 90 horsepower in 4-stroke or 75 or 90 horsepower Optimax™ 2-stroke. Also choose from several canvas options including a full stand-up enclosure plus fishfinder and trolling motor upgrades, two choices of Fusion marine stereo options, seating changes, a battery charger, plus trailer upgrades.